This post is sponsored by Metrie. We wrapped filming for the Lowe’s Bathroom Makeover we’re doing at our friends’ home late last night. 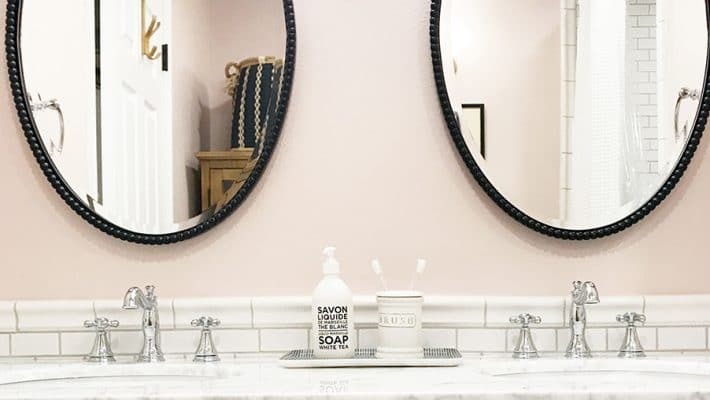 Although the four how-to videos are all done, we still have a few loose ends to tie up before the bathroom is completely finished–but, we are ecstatic about much we accomplished in just one week. 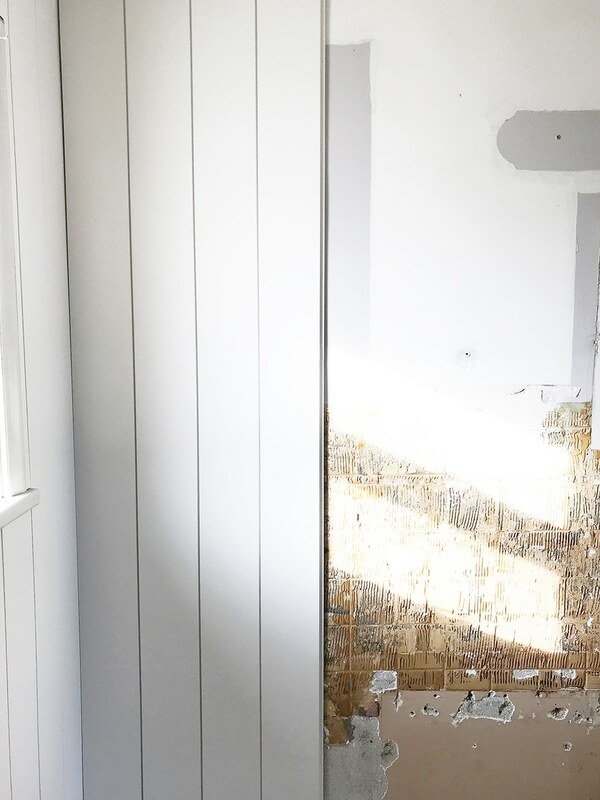 Because of the tight timeline, we really needed a beautiful, quick solution for the walls and we found just the ticket in Metrie Complete® Pre-Painted Shiplap. Yup, pre-painted! We had demoed all the wall tile and the arch (and the majority of the space to be honest) and were left with a lot of cinderblock walls. 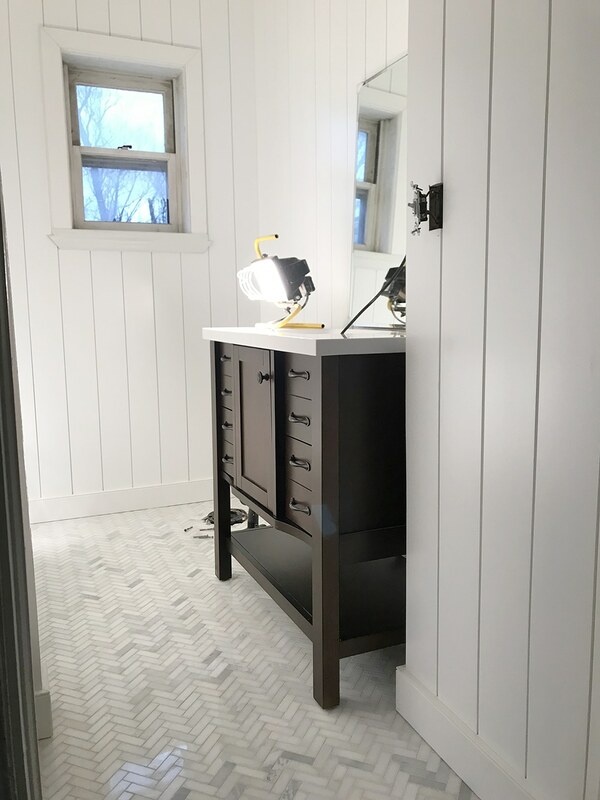 This Pre-Painted Shiplap from Metrie helped transform this room in just one day! The shiplap boards are already primed and painted a Polar-White color–a really beautiful white–perfect for any decor scheme. Thereʼs no paint prep, or paint to clean up—just install and youʼre done! While not always needed, we used liquid nails on the back of our boards since we were attaching them to cinderblock walls. Each board overlaps the one next to it, so there’s no visible wall showing through in between the boards. We then had to drive a few nails into the fronts because of the crooked walls. But! Metrie sent along this “magic stick,” as we started calling it, that made the nail holes disappear instantly. Pre-painted boards! Disappearing nail holes! It really doesn’t get easier. It’s called the Metrie Complete Premium Wax filler. You just go over the hole and buff off the excess and it’s filled and doesn’t even need any additional paint, sanding, or caulk. We took a quick video to show how easy it is. While the process could not have been simpler, this page has a great how-to video, step-by-step instructions including imagery, a complete shopping list for everything you’ll need to complete the shiplap installation project, a Where to Buy map to find the closest retailer to you (you can order it through the Pro Services desk at your local Lowe’s! ), and a product calculator so you’ll know how much product you need before you even go to the store. Shiplap is traditionally installed horizontally, but we love the fresh vertical take on it here. And with so many other moving parts to this project, it was so nice that this aspect was straight forward and swift at covering those unsightly old walls. We’ll end with a little sneak peek at what’s to come. Can’t wait to show you the afters! Anyone else into vertical paneling lately? Or dreaming of pre-painted trim!? Dreams come true. Dreams come true. « Ep 50: Designing a Home For Airbnb Vs. To Live In & Which Minimalist Are You? Hi! Since it’s going in the bathroom did you need to stain the boards because of moisture? These boards come pre-painted and sealed. Nope! 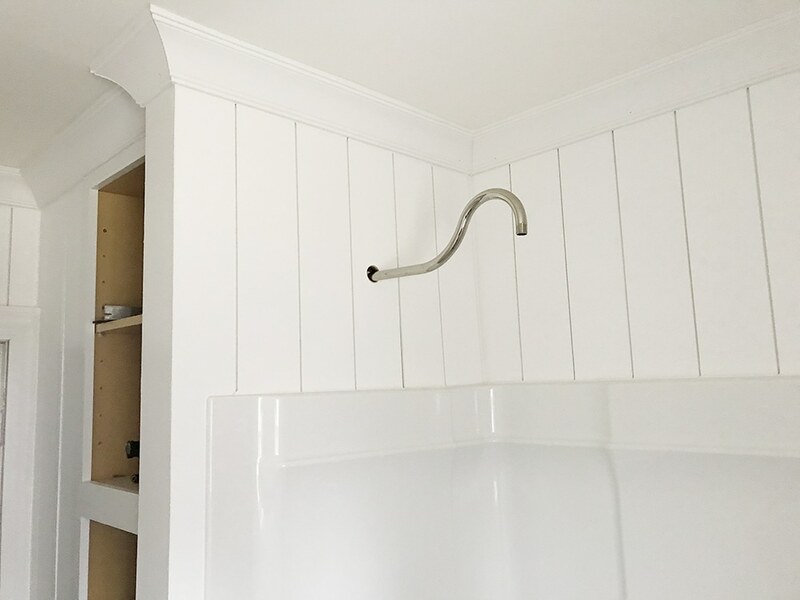 The bathrooms is vented well and the paint on the shiplap holds up well, but each space may require a different approach. Is the baseboard trim right over top of the vertical panels? It looks like you ran the paneling all the way to the floor. In this case, aren’t there tiny gaps behind the baseboard trim where each groove is in the paneling? Did you caulk these gaps? Curious to know how you completed that part of the project as I am working on a similar one. Thank you! I’m belatedly catching up on older blog posts and and really digging this vertical shiplap! How did you handle the corner where the tub wall meets the closet wall? I’ve been squinting at the pictures for clues, but you did such a good, seamless job I can’t tell how you did it. Part of me (well, most) is hoping that it isn’t mitered because even the thought of having to do that scares me! Gah! It’s mitered! You could also do a L-corner trim piece if mitered is too much for you. This looks awesome! I would love to know what you find about product availability as well. I’m in Los Angeles and the closest Lowes that carried it is 100s of miles away and it doesn’t show any online option. I agree with Emily. Great that someone sells it but I’ve contacted all of my Lowe’s stores along with numerous lumbar yards and no one can order it. That’s so insane! Let me talk to Metrie and see what the deal is. I was so excited to see these pre painted slats! Perfect for a little weekend project i had planned. But then i found the only way to get this product was to drive to colorado😰 I live in Salt Lake and have several Lowes within 20 minutes, yet i couldn’t even find a ship to store option. How can I get them to take my money for this product? Any chance this would work on ceilings? Moving into a “new” older house with popcorn texture next month after being in a new build home with smooth ceilings. I’ve been considering beadboard sheeting and trim to cover the popcorn as opposed to paying to have them scraped, repaired then painted. I’m planning to go low contrast on the walls and millwork (whites) so I fell in love with the idea of making the ceilings a feature. We prefer to DIY but when we move our 4 kids will be 4 months, 23 months, 4 and 6 so easier/more efficient/cleaner wins. I think these metrie planks could be a solution that we could DIY over a few weeks if they would work for this application. We had seen the Armstrong brand ceiling planks but these look easier to install possibly. Any ideas or advice would be amazing. Thanks for being awesome! Love your blog, podcast, insta, etc. These would definitely work, so long as what’s under the popcorn texture is sheetrock & studs as opposed to plaster. You’ll need to nail them up, so having something you can nail into is important. It’s also nice that these are prepainted, so that will save some work, too. That sounds perfect as the popcorn is over sheetrock. No painting is such an amazing perk too! I will be ordering via Lowes and will share an update. Thanks for the recommendation! I’ve loved following along with the process on your stories! After just finishing my bathroom in 6 weeks I’m super impressed at how much you did in a week! This is amazing and I want you to come to my house! I do not have enough room for the cabinet but you have inspired me with the vertical shiplap. Whoa! Those are perfect. Are they tongue and groove ? Thinking about doing a tongue and groove style for my kitchen ceiling, and this might work! Could you install something like this right onto studs? We bought a home built in 56′ that has a quarter bath in the basement (NO SINK?!) and currently doesn’t even have drywall. It does, however, have a pencil sharpener in it, in case any of your pencils get dull while you’re going to the bathroom. Needless to say, it doesn’t get much use. I have been considering shiplap on the walls, but can’t find information anywhere on whether or not I need to install drywall or some other kind of base first. Any suggestions? It can go right on the studs!! 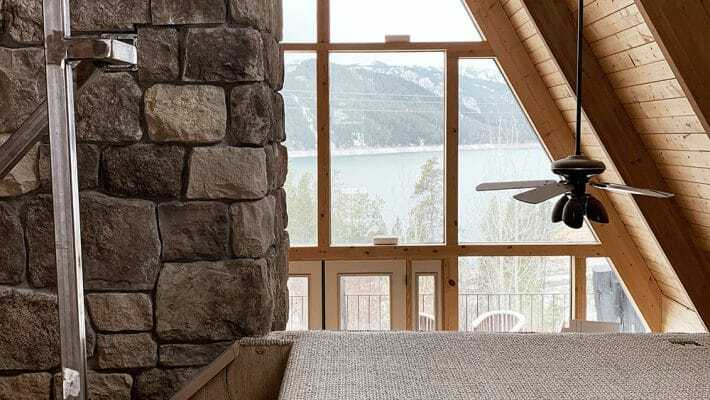 You might not be able to use the paneling vertically if you don’t have a solid base like concrete or drywall but the traditional horizontal would totally work with just the studs. 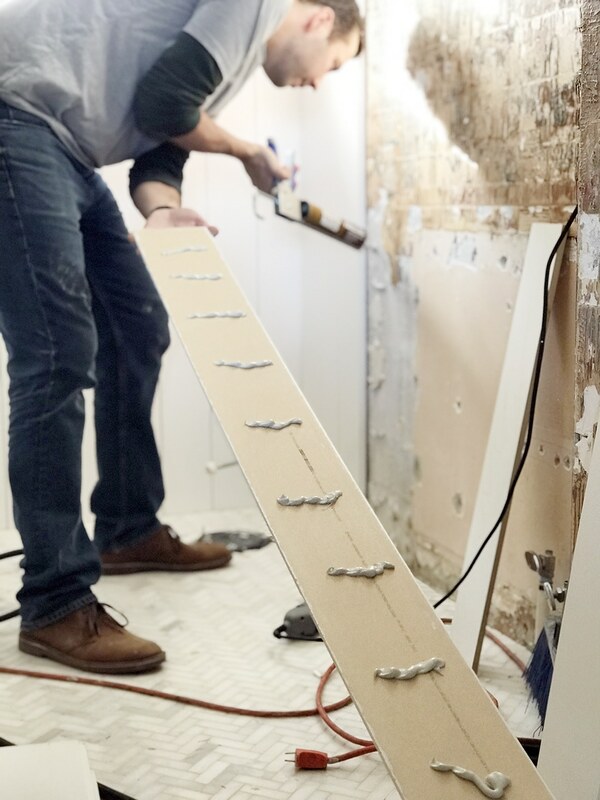 Your quarter bath is probably small enough that the panels will span each wall without needing to begin and end in the middle of a stud for a seam. I did TONS of research on this question for a cabin we’re renovating. 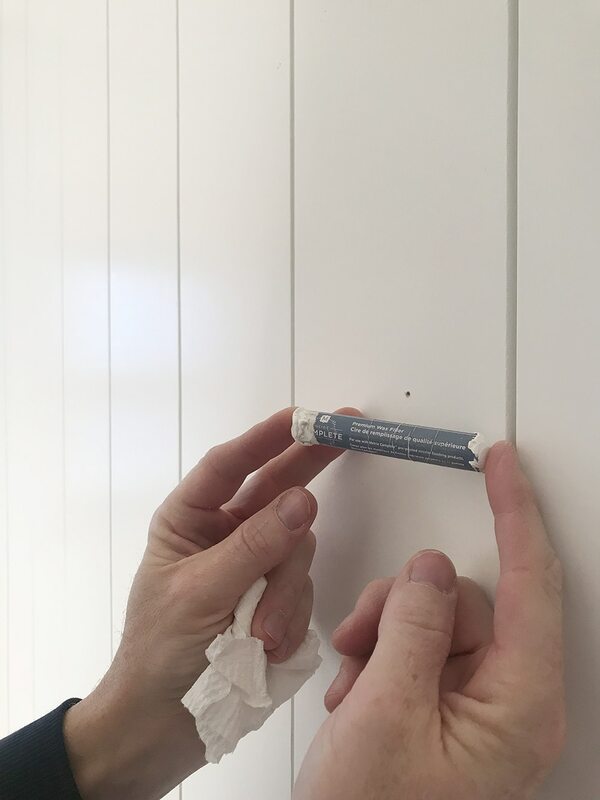 Here’s what I learned: you definitely can install shiplap straight onto the studs — as Ryan noted, it will be easier if you install it horizontally. BUT: if you’re working on an exterior wall, shiplap won’t stop drafts from getting through. Air will come between the tongue-in-groove joints. So in that case you’d want to install a vapor barrier of some kind first. If you go with plastic, use one that’s “smart” about moisture — a regular plastic sheet will trap moisture and lead to mold problems. This gives me so many ideas for when I redo my bathroom! I’m a brand new homeowner that has never renovated anything. I’m excited to see the videos! I love the trend of vertical shiplap! We have vertical paneling in our house that was built in the 80’s and we painted it white when we moved in 4 years ago. I always felt that it wasn’t “popular” but I loved the look of it and all of the beautiful trim detail that it had. I am so thankful that we didn’t tear it down! Beautiful bathroom! I can’t wait to see the finished product and the videos on lowes.com! I was also curious about moisture in the area – it’s such a great idea if it will stand up against the moisture – also are you going to give total budget on this project? We’re happy to give a budget rundown when we reveal it. Because this bathroom gets such good ventilation with a fan and window, plus the super durable paint that Metrie uses, we’re not concerned. Curious about installing on cinder-block, as I’m in the same situation at my home. Do you know if there will be a potential for moisture/mold issues with the shiplap being placed directly on the cinder-block? 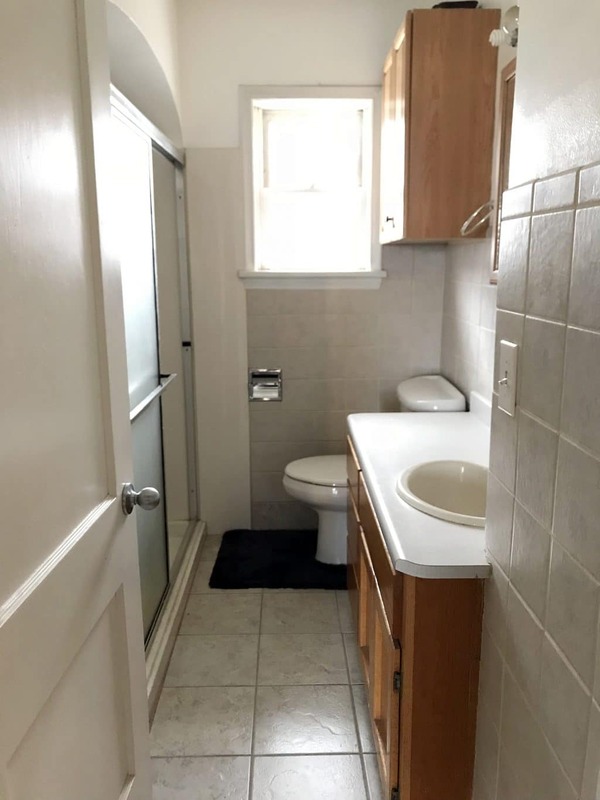 There’s always the potential for mold in bathrooms. But this one gets really good ventilation, and the paint Metrie uses is VERY durable, plus we used a surround in the shower area, so we feel very confident this will stand the test of time. We put ours in horizontally in my old house (https://thehappycrazyhouse.com/house-tour/kitchen/) but in our current house in the sticks, the slats are vertical – Love the change up. Although where is the heck was the Metrie Complete Premium Wax filler while we were renovating the old house??? Filling those nail holes was brutal. I will have to get some so I can have it on hand. Gorgeous! I’m loving the vertical ship lap moment currently happening. One question. 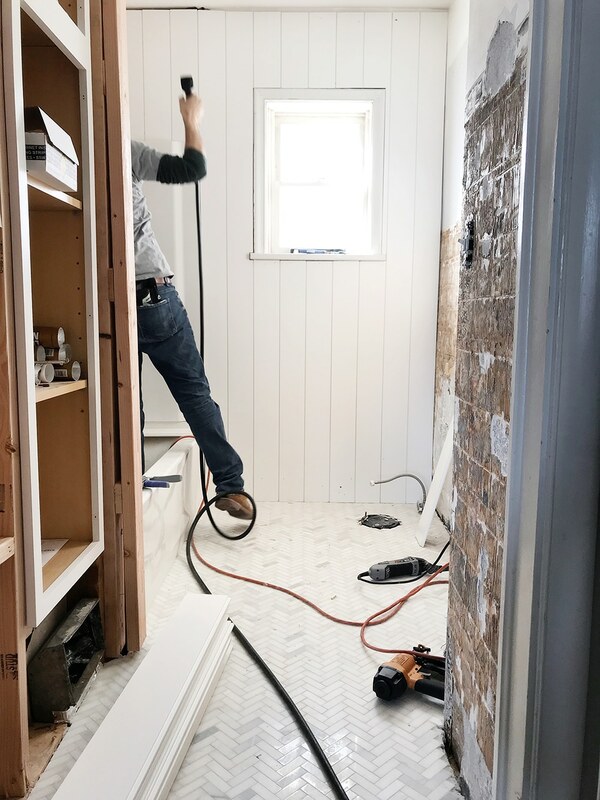 Any concern about the shiplap in a moisture filled room like a bathroom? I would really be interested in a response to this questionbecause our bathroom is not well ventilated and we live in the PNW. I was thinking of installing it over drywall but I am afraid it is a moisture trap! The walls look great – but the floor tiling is categorically the star of the show, just perfect!